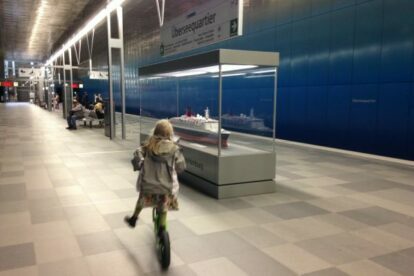 In some of the Hamburg subway stations you can find surprising gems. One of my favourites is the ship at “Überseequartier”. It is part of the “harbour atmosphere” which the architects tried to create even underground. Once you take the stairs upstairs you’ll be in the Harbour City. But back to downstairs. When I walk out the U-Bahn (metro) I first check the ship which represents Queen Elisabeth 2 and is a loan from the nearby international maritime museum. And I love to be cheered by the sound installations at this particular U-Bahn stop which accompany people on the escalators and are made of maritime sounds to match the architecture and the location of the metro at the Harbour City district. Harbour feeling underground? Check!